Safety Technology International, Inc. - STI 9110 Thermostat Protector with key lock. 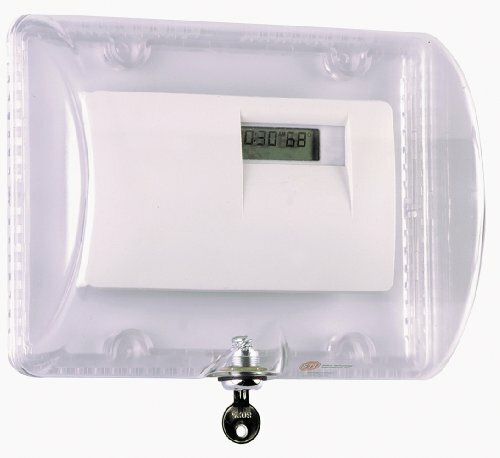 Especially useful in public areas; this clear polycarbonate protector helps stop vandalism, damage and tampering of large thermostats and energy sensors. Molded of clear, 1/8" thick, heavy-duty polycarbonate material. This protective cover is ideal for areas where abuse is a problem: vandalism, accidental damage or costly annoying tampering by employees and others. Includes a lock and key assembly for added protection against abuse. Easy to install for either flush mount applications or surface mount installations with a 2-inch spacer. Holes in the frame allow air to circulate freely for proper operation of protected thermostats or energy sensors. An inner wall on the frame prevents tampering with dials and levers. Comes complete with all mounting hardware. This super tough unit is backed by a 3 year limited warranty against breakage and damage in normal use. Safety Technology International, Inc. "We protect the things that protect you"